Since starting my marathon training, I’ve put in more miles than ever. Right now, I’m to the part of my training where my long runs are over 12 miles. Since I’ve only ever gone 13.1, today’s 14 miler was a little intimidating. However, I forced myself to get out of bed by 6:30 this morning to get my run in. It was pretty, but I got it done. When I started I decided I was just going to walk the whole thing. Then I decided that I didn’t want to go 14 miles, so I’d only go 6 and call it good. Finally, I compromised with myself and did the entire 14 miles but switched my intervals so I was walking 3 minutes and running 2. I’m glad I did too. The very last mile was a tough one to push through. But, I did it….I made it 14 miles! Only 1 problem…I was still about 2.5 miles away from where I parked my car when I hit my 14 miles…yep…way to plan Tammy! Since my feet were hurting and my knee was acting up, I decided to walk a slow/casual pace. Yep…it was slow alright! I finally got back to my car and laid in the backseat so I could prop my feet up for a bit to get the swelling to go down. That felt great! I ended up getting blisters between my big toe and the next one over. I don’t know….I don’t know how I got it either! I stopped by HEB for my chocolate milk (my Saturday treat) and picked up some double stuff Oreos. Just a word of advice, don’t do 16.75 miles on an empty stomach. I’m sure I don’t need to tell y’all that…but thought I’d pass it on anyway. Thankfully, I was able to eat only a few and close the bag back up. I could have easily scarfed down the entire package! Once I got home, I took my ice bath, doctored my blisters, and put my feet up on the coach. It feels good to be back home. This entry was posted in Workout and tagged 14 Miles, Long Distances, Marathon Training, Race Training, Workout on October 29, 2011 by Tammy. You know…the hardest thing about blogging is coming up with the damn titles! Sometimes I just choose random titles but usually I try to make it relevant to the post itself. Take this one for instance…WOD…Workout of the Day. Since it was a CrossFit day, it fits. Clever huh? huh? yeah, ok, so it was a bad play on words. Anyway….moving on! We started today’s CrossFit a tabata round of weighted sit-ups. Toward the end I was only able to go 1/2 way up. Shane asked us if we wanted to do abs before or after the WOD. He didn’t care, we were going to do them either way! Michelle and I both agreed it would be best to do them first because afterward we’d be too gassed to do them properly. Have I mentioned how much I don’t like sit-ups? Well…I don’t but they do work your core. The WOD was 3 rounds of running 400 meters, 30 OH squats (I used the 35# bar), and 21 pull ups. Since I can’t do a pull up yet I just do jumping pull ups, which is still work. I’m a very slow runner. In fact, I’m more of a walker than a runner. Shane felt we should be able to finish in 15-16 minutes. Pppffftttt…right! The first run wasn’t too bad. The OH squats right after the run was a little tough because I was breathing so hard, which affected my hold on the bar overhead. The second run was quite a bit slower. It was a bit drizzly but felt pretty good because it was cool. When I was coming in from my second run Shane told me that I could modify the run if I needed to because he just wanted me to be able to finish the entire WOD. I just nodded my ok while thinking “Like hell I’m going to modify the run. I will finish the WOD. I will finish the WOD.” That became my mantra for the last round. I think I was more waddling than running that last round, but I finished the run and the entire WOD in 21:53. Needless to say I wasn’t close to his 15-16 minute estimate! None of us finished in less than 19 minutes. However, I’m proud of all of us. I think we have all improved. I know my first workout put me out of commission for a week. I was so tired afterward that I would have been happy for someone to carry me to my car and was sore for days! 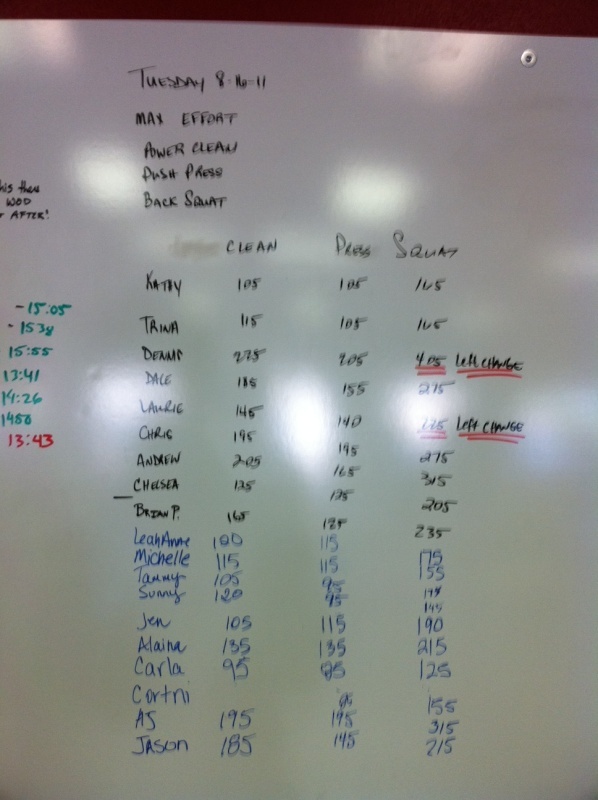 AND….that was only 5 rounds of 15 OH squats (I used a dow…so no weight) and a 100 meter run. It’s amazing what a different a month can make. 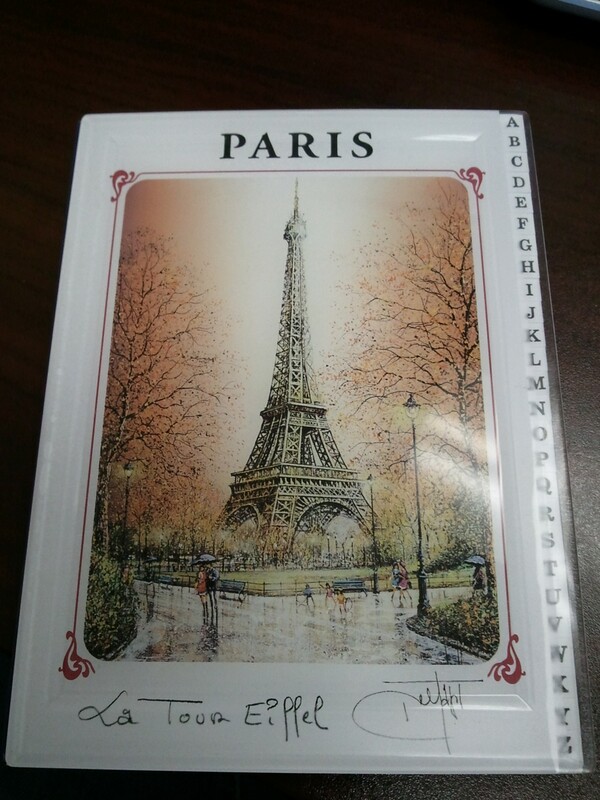 On the de-cluttering front, I am getting rid of an address book my old boss brought me back from her trip to Paris. I have all my contacts on my phone, which is backed up to my computer, so I don’t think I need it anymore. In the trash it went! Update on my Grandfather: They moved him to an acute longterm hospital tonight. The nurse attached an EKG machine to him, then proceeded to push the cart away while he was still hooked up to it. I’m hoping that was just a mistake and not a sign of the care he’ll be getting. They are keeping him sedated because he isn’t “doing well” when he’s off sedation. Whatever that means. They told my Dad and Grandma that they will be trying to get him off the respirator over the next 5 days; However if they are not able to get him off the respirator then the family will need to make a decision on what to do. His kidneys are still only functioning at 40% as well. It has been such a roller coaster. I thought he might actually pull through this, being the stubborn old goat he is, but now I’m not sure. So, we play the waiting game again. This entry was posted in Home Organization, Workout and tagged 400 Meter Run, Crossfit, JanGTD, OH Squats, Pull Ups, Sit Ups, Tabatas, Workout on January 4, 2011 by Tammy.